Jack Fresco is an American futurist, a self-taught industrial design engineer, inventor, author, artist, and behavioral scientist. He was born on March 13, 1916 in Brooklyn, New York. He has worked as a designer and inventor in many fields of science, and is best know for his innovative project ‘The Venus Project’. He has been praised for his intelligence and the immense love he shows for truth, labelled as called the modern Da Vinci, also described as an idealist, a dreamer, an utopist and even a prophet and a genius. Fresco was born to Isaac Fresco and Lena Fresco, two immigrants from the Middle East. He had two siblings, Freda and David. He grew up in Bensonhurst in Brooklyn, New York in a Jewish home during the great depression period. He dropped school before college and chose to learn independently what interests him the most, and passed his time at the local library. He also passed long hours atop the roof of his house with his friends discussing ideas about Darwin, Einstein, and the future of science. Fresco also showed great artistic talents, he was granted the first prize in a New York theater contest, and managed to spend some time painting. He travelled a lot across the United States, and during his frequent travels he could see people living in the street and suffering from poverty while factories had plenty of goods ready for use, and this was why he started thinking about installing an alternative economic system that should not be based on money. At an early age, Fresco joined the Young Communist League before leaving it after a disagreement with its president and joined the Technocracy association. In early 1930s, Fresco moved to Los Angeles, where he started a structure designer career. He had two marriages, and divorced his second wife, Patricia, in 1957 after having two children from her: Richard, born in 1953 and died in 1976, and Bambi, born in 1956, and died in 2010 of cancer. During the late 1930s, Fresco worked as a designer at Douglas Aircraft Company in California. However, many of his futuristic designs were considered to be impractical at the time, so he had to resign due to design disagreements. In 1942, he served in the Army as a technical designer, and could produce up to 40 designs a day, and helped improve safety systems for military aircrafts. But because he could not adjust adequately to military life, he was eventually discharged. At the age of 32, he teamed up with both Harry Giaretto and Eli Catran, and created the Trend Home, mostly built of aluminium and glass. This model gained access to Hollywood and was displayed on the 8th stage of Warner Bros for three months attracting a lot of attention. This was one of Fresco’s career successes. In the early 1950s, he created and directed the Scientific Research Laboratories in Los Angelos, and worked as a freelance inventor, a lecturer, and a scientific consultant. Fresco also worked as a creator and a designer of science fiction models and special effects, as in the show Ring Around the Moon. He showed great skills and became a cinematic technical adviser and worked on Lou Stoumen’s documentary ‘The Naked Eye’ in 1956. Fresco’s most notable work is the Venus Project, a series of ten buildings located in Florida. It is a research center for Fresco and his partner Roxanne Meadows, and an educational center. They try to research and install a new resource-based economic system. 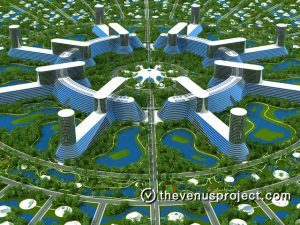 The goal of the Venus Project is to create a representation of how society could be designed, if it was built using the economic theory of a “resource-based economy.” This entails doing away with capitalism, socialism, and communism; jobs are made irrelevant in favor of automating tasks using technological solutions. It also entails ending the use of money, instead distributing resources using scientific principles. Some of these ideas are similar to the earlier Technocracy movement. This would allow society to arrive at decisions about how resources should be distributed, rather than merely making arbitrary decisions. The vast reduction or potential elimination of a dependency on oil and other unsustainable energy sources in favor of alternative and sustainable energy. The reduction or elimination of the primary incentive for criminal behavior with the removal of the money system, thus vastly reducing crime rates. The elimination of elitism from human society and simultaneous removal of the influence of ideology from human behavior [and yet they still claim with a straight face that they aren’t utopians]. The Venus Project can be divided into two halves. The first half is a fairly standard claim that central planning is more efficient and fairer than capitalism. This argument should be fairly familiar to anyone who’s studied Soviet communism, although the Venus Project seems to think they’ve found the way to fix that system’s crippling problems and make it work. You see, they’ve taken the fallible human element out of the equation, and instead, there will be computers. With sensors. And they will decide everything. Perhaps unsurprisingly, this is the point where things get vague. Let’s hear it from the horse’s mouth. Who makes the decisions in a resource based economy? No one does. The process of arriving at decisions in this economy would not be based upon the opinions of politicians, corporate, or national interests but rather all decisions would be arrived at based upon the introduction of newer technologies and Earth’s carrying capacity. Computers could provide this information with electronic sensors throughout the entire industrial, physical complex to arrive at more appropriate decisions. How important are cars relative to fridges? Unfortunately, as anyone with even a basic knowledge of computers could tell you, someone has to program them. And unless we somehow develop a hard AI, the people who program the computers will have to make decisions. Given that we have scarce resources, the central planning computer needs to have a way to prioritize between millions of competing desires. How important are cars relative to fridges? How big should these fridges be? How often do they need to be replaced? Should we make more fridges or more fridge factories so we can make even more in the future? The Venus Project doesn’t have an answer to any of these questions. Or even designs for robots to accomplish every mundane task, which seem essential to the scheme. But they can tell you what the “architectural design center” will look like! Also, there will be hovercars! Even on a conceptual level, the Venus Project’s program is not revolutionary. Chile under Salvador Allende attempted to implement a cybernetic system to manage the new socialist economy, known as Project Cybersyn[wp] (short for “cybernetics synergy”). Designed by British management cybernetics theorist and former United Steel executive Anthony Stafford Beer, Cybersyn would use a network of computers and telex machines to come to cybernetically sound decisions for the economy, resource management, and allocation of goods and services. Similar projects were conceived by the Soviet Union and East Germany, but never implemented. While the system had a snazzy, high-tech control room that looked like it was lifted from Star Trek, it soon found itself plagued by the very same bureaucratic problems it was intended to solve, though it was famously used to thwart a strike by truck drivers in Santiago in 1972. It will never be known how well the system would have worked in the long run, though, as Augusto Pinochet shut it down after his coup in 1973. A common talking point from Jacque has something to do with his dislike of “money”. He wants there to be “no money”. This notion seems confused in several ways. To see this, one merely needs to learn about what Money is, practically and philosophically speaking, and then look to see how Jacque’s “no money” idea would look exactly the same even if it had money. Now that you’ve read the Rationalwiki article on Money, or gotten yourself educated about the subject in some way, let’s take a look at how the Venus Project would look the same with money as without money. It’s in the computers. They have to make decisions somehow, because there is scarcity. Jack likes to say there “won’t be scarcity”, but then goes on to say that decisions are made relative to the “carrying capacity of the earth”. That’s scarcity. Anyways, coming at it from the other direction, where there is money, it’s simple to make the same system. The money is digital, and no one works for money, they simply get a steady income. Similar to today, where some items are very cheap (five cent candies!) everything in this hypothetical world is likewise cheap, because of robots. Can an individual order an interstellar spacecraft from their local robo delivery service? Presumably, yes. So you just never run out of money. And if we get too close to “the carrying capacity of the earth”, then some things will indeed be expensive enough that you might need to save a few months of income to purchase it. It seems that the Venus Project would need to be similar to the above thought experiment. They just don’t want you calling it “money”. Some day far in the future, a society may even get close to this. Lots of taxes, lots of money hand outs, lots of robots. Far enough in the future, and those robots may nearly be able to “eliminate scarcity”. It’ll be great. But The Venus Project doesn’t have a realistic plan for getting us anywhere near there. Phase One: Build a 21-acre research facility. Phase Two: Produce documentaries and, eventually, a feature film to promote the movement’s aims. In the works. Two documentaries have been made already: Paradise or Oblivion, and The Choice is Ours. The big damn movie is, alas, not out yet. Phase Three: Build an experimental research city to act as a test run. This city will include a theme park designed to both entertain and educate people about their plans… hey, wait a minute, this is basically Walt Disney‘s original plan for EPCOT, isn’t it? Build an experimental city of the future!! !, then build a theme park to lure people in — genius! Around 2008, Peter Joseph, creator of the conspiracy documentary Zeitgeist, discovered Jacque Fresco and the Venus Project and liked what he saw, aligning his budding Zeitgeist Movement with the organization (calling it “the activist arm of the Venus Project”) and endorsing it heavily in the sequel Zeitgeist: Addendum. However, the Zeitgeist Movement’s preoccupation with conspiracy theories and assorted grassroots libertarian/communal/anarchist projects alienated many people who had been involved in the Venus Project beforehand, including Fresco and co-leader Roxanne Meadows, who feared that the organization’s aims were being muddled and that Joseph and the Zeitgeist Movement were trying to marginalize them and steal their ideas. By 2011, this had produced a formal split between the Venus Project and the Zeitgeist Movement, with Fresco and Meadows claiming that Joseph didn’t understand the Venus Project’s goals and Joseph countering that Fresco’s plan (particularly the big feature film) was unrealistic and that efforts towards a “resource-based economy” were better spent elsewhere. In short: the people who wanted to elevate humanity above greed, pettiness, and the lust for power ultimately succumbed to it themselves. Despite all their talk about eliminating money and private property, Fresco and Joseph both ultimately wanted to control the movement, and rather than compromise and arrive at decisions about how the movement’s resources would be allocated, they both tried to make arbitrary decisions about its direction. Fresco also authored and co-authored many books, such as ‘Looking Forward’, co-authored with Kenneth Keyes Junior in 1969. This book pictures the ideal cybernetic society in which only individual gratification counts, and no work exist anymore. In 1977, he published the ‘Introduction to Sociocyberneering’ book. Two years later, he wrote another book, ‘Structural Systems and Systems of Structure’, and the ‘Venus Project : The Redesign of a Culture’ in 1995 where he explained his ideas and views about the Venus Project. In 2002, Fresco published one of his most brilliant works : ‘The Best That Money Can’t Buy : Beyond Politics, Poverty, and War’, and in 2007, he published his most recent work ‘Designing the Future’. In 2006, ‘Future by Design’, a semi-biographical film about Jack Fresco had been produced by William Gazecki, and Fresco had been featured again in the film ‘Zeitgeist Addendum’ by Peter Joseph in 2008, where his alternative ideas about the future were clearly explained. Fresco has been invited as a guest lecturer by so many institutions and higher education, such as Princeton University, Queens College, University of Southern Florida, Institute of Technology of Vienna, Columbia University…etc Today, Fresco is a lecturer and tour guide at the Venus Project Location in Florida, and lives in the same town, in Coral Gables.